From our state-of-the-art facility in Chicago’s West Loop neighborhood, our primary chiropractor, Dr. Yousef Zaffarkhan, empowers his patients to script their own health and wellness journey. With certifications in Diversified, Thompson and Gonstead spinal chiropractic techniques and years of experience incorporating complementary wellness services, Dr. Zaffarkahn utilizes an innovative approach to help his patients proactively participate in their recovery plan after an injury while also reducing chronic pain. At the foundation of chiropractic medicine is a holistic approach that includes incorporating a broad range of modalities that help restore the body’s natural ability to heal itself. Just as each person has unique physical characteristics, every health condition has distinct symptoms and requires an individualized protocol. Dr. Zaffarkhan may recommend nutritional counseling, orthotics, massage therapy, or a combination as part of a complete wellness plan for some patients while prescribing acupuncture and Flexion Distraction techniques for others. Also worth noting is that every massage technique is not appropriate for every condition. For instance, Active Release Techniques (ART), which treat tightness and tension in muscles, tendons, nerves, fascia and ligaments, can be combined with spinal manipulation to ensure muscles and connective tissue function properly. While this approach supports overall spine health, other massage treatments may be prescribed primarily to encourage relaxation and stress relief. Different health goals demand different diagnostic and evaluation exams, too. Our doctor uses state-of-the-art technology to assist with accurate diagnosing and treatment program design. Our goal is to eliminate the source of pain rather than manage pain from an outward-in perspective. Using CBP (Clinical Biomechanics of Posture), Dr. Zaffarkhan is able to identify spine alignment deviations, and recommend specific corrective actions to restore normal, healthy function. Long-term spinal changes are possible through a combination of spinal manipulations, corrective exercises and traction. Determining which techniques and services are most beneficial is the first step in creating a plan toward good health, wellness and vitality. There is no singular path that works for everyone. Two patients with the same, or similar symptoms, may experience better outcomes from different techniques. AO (Atlas Orthogonal Technique,) which adjusts the cervical spine, may be the preferred treatment for a certain condition. Alternatively, our Chicago chiropractor may decide that SOT (Scaral Occipital Techniques), which focuses on aligning the hips to support the internal organs and back health by balancing the pelvis, is a better option. From our well-equipped facility in Chicago's West Loop Neighborhood, Dr. Zaffarkhan and our team are helping families create better health and wellness strategies. We invite you to call today to schedule an appointment or to discuss the broad range of services and health maintenance tools available to you and your family. 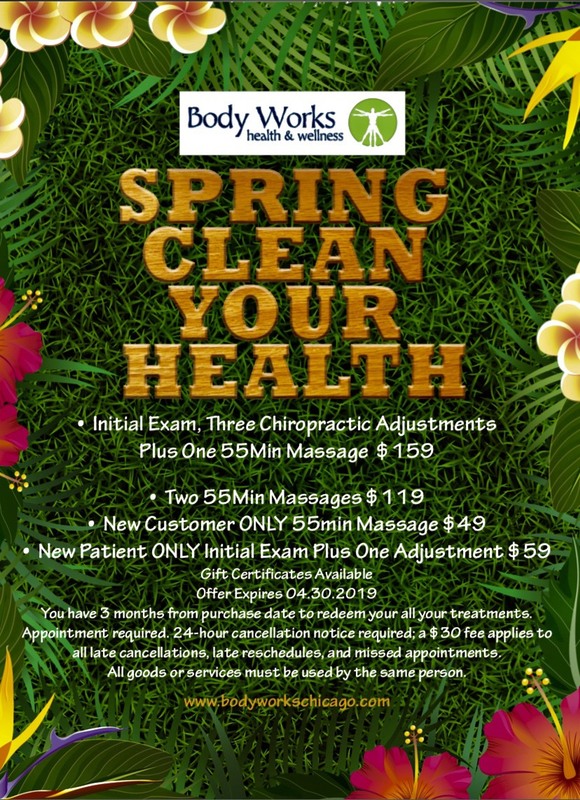 Restore Life's Balance with Body Works Health & Wellness and check out our brand new facility located in Chicago's West Loop! For more information or to schedule an appointment with our Chicago chiropractor, call (312) 733-8676 today!